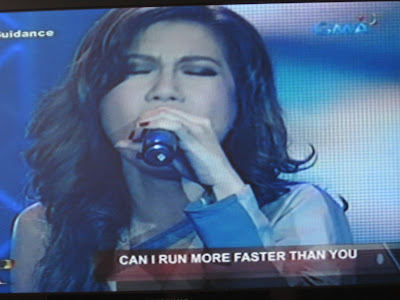 Fierce Blogs: Rachelle Ann Go - Make Up Or Mess Up? Share I was watching some TV last Sunday and saw this. At first, I thought I saw a guy dressed in drag - in a bad taste that is! I used to like Rachelle's simplicity. But boy! This time around she's gone wild and messed up. She doesn't have to wear that much make up, I think. Not to mention those lines on her nose that can stab you to death! Lolit - I agree. I also saw this and feel that the make up is really heavy and badly done. Bwahahah This made my day! I miss this type of blogs from Fierce Blogs. This is really what sets you apart from the other pa cute bloggers lang. her face look like it's drawing! may be she did her own make up?